Textile artist Hollie Hermes sits atop the "sperm whale," a large fuzzy creature that dominates one of the many rooms of Otherworld. Jordan Renda started crafting haunted houses in high school in his parents’ basement. When escape rooms got big, he saw an opening. “It was a lot more interesting because you’re not just walking through a space and giving people a flight-or-fight response, you’re telling a story and you can build off of it,” Renda says. Except when you enter Otherworld, you’re left to wander the desolate research facilities alone. “And the bank didn’t laugh us out,” he says. Since June, Otherworld Industries has been headquartered in a Reynoldsburg strip mall – well, former strip mall might be more accurate. Everything here is empty: Target, Office Max, hobby store, Sports Authority. At the moment, it’s not very impressive from the outside. Fabrication director Leland Drexler-Russell thinks that works to their advantage. “Our abandoned, sci-fi research facility lends itself really well to this abandoned strip mall that we’re in,” Drexler-Russell says. 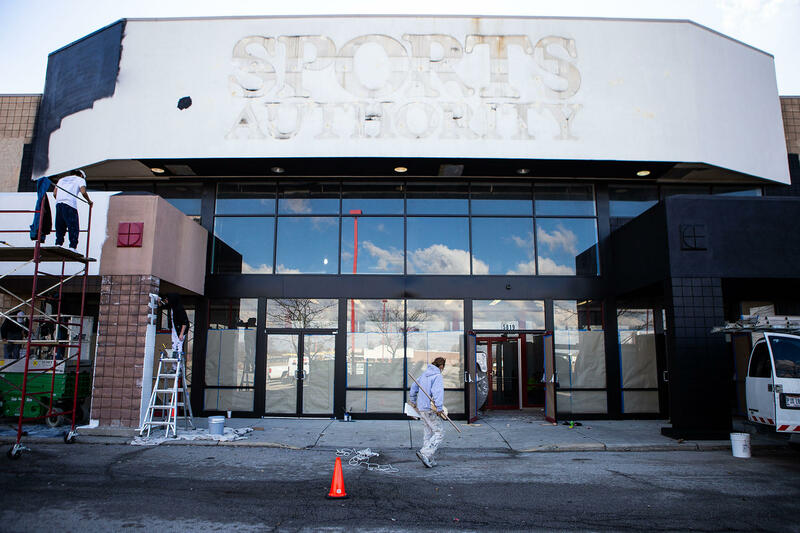 Otherworld is being built in an abandoned strip mall in Reynoldsburg. Creative director Jordan Renda said to find a space large enough for their needs, they had to look outside of Columbus. Inside the construction site, artists and contractors work at a hurried pace. 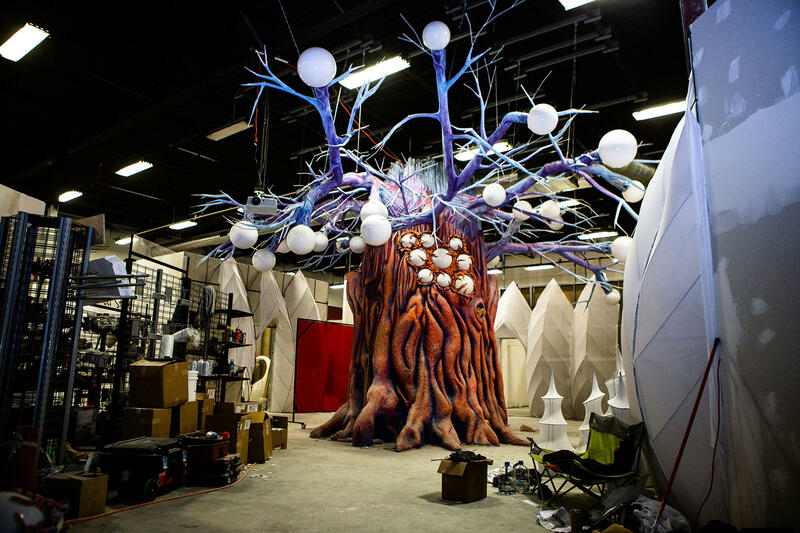 Otherworld aims to open its 40,000 square-foot exhibit by the end of March. Each room offers its own universe, with a distinct concept or theme. As a visitor to Otherworld Industries, you’re left alone to wander, discover and build the story yourself. There’s no linear story, Renda says, so visitors may have to return two or three times before they fully understand what’s going on. 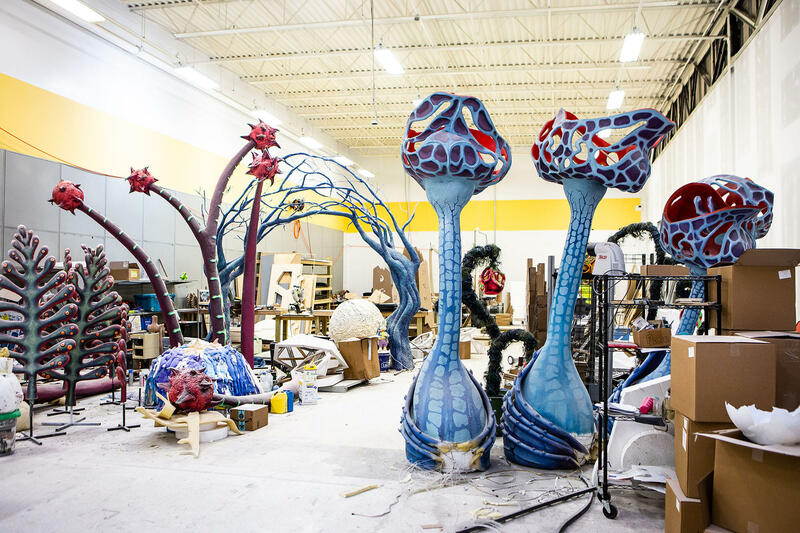 The Tree Of Life sits at the center of Otherworld's ambitious maze. “We want to give the people of Columbus that they’ve never had before,” says art director Scott Schaaf. Most of the spaces are still empty or half-finished. Schaffe walks us through an arch of baby doll heads and an eerie church to reach the center of the maze: The Tree of Life, an imposing structure with branches of glowing orbs. Nearby is the Watcher, a 19-eyed interdimensional creature whose video-projected pupils follow you across the floor. It’s not the only strange monster hiding around here. Hollie Hermes stitches up another monster. Hermes is the head of textiles for Otheworld, and is in charge of everything from fabrics to faux-fur. “We’ve entered what we call the fuzzy things room,” Schaaf says. In this claustrophobic space, we’re dwarfed by a 10-foot-tall blue monster – sort of like a cross between Cookie Monster and a sperm whale. “Definitely a Jim Henson on steroids situation,” Schaaf jokes. This is the brainchild of textile design lead Hollie Hermes. Inside the workshop at Otherworld, which is housed inside a 40,000 square-foot former Sports Authority in Reynoldsburg. Hermes, who Drexler-Russell recruited in August, is one of dozens of artists from multiple mediums collaborating on Otherworld. Her authority extends to everything from fabric to faux-fur, including a horde of neon green spiders and a red velvet hallway. For the fuzzy things room, she wanted to evoke a child’s vibrant imagination, where you can climb or sit on every surface. When I visited again in January, pink surfboard-shaped monsters covered the walls. “I just wanted it so cheesy that it got so cheesy it became art again,” Hermes says. 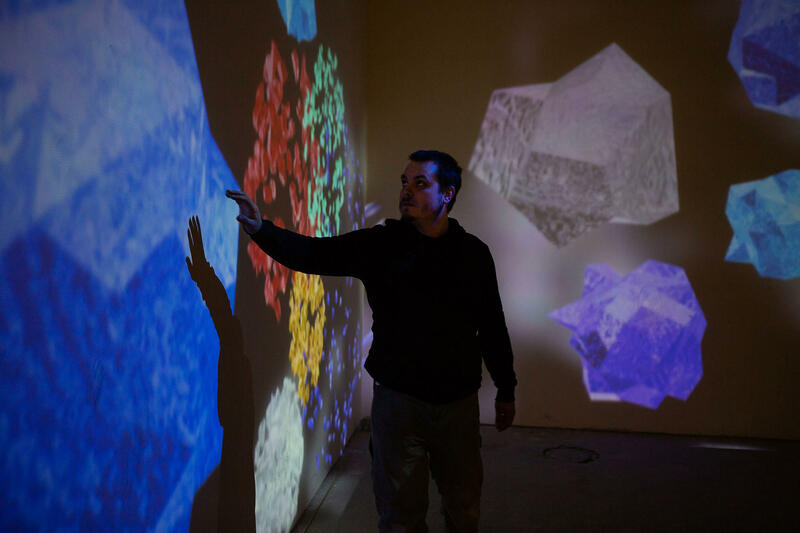 Phil Liddell, Otherworld's tech director, demonstrates an interactive animated projection that explodes when you touch the wall. Renda went to Ohio State, while Schaaf went to school at the Columbus College of Art and Design. Both recruited more local artists to join the crew. Drexler-Russell, on the other hand, hails from the Austin art collective Future TBD. He’s worked in public interactive art for seven years, and came onto the project early in its life. He first met Renda in St. Louis, where Renda first revealed his concept. For the next four months, they talked on the phone almost every other day, developing the rooms and storylines. 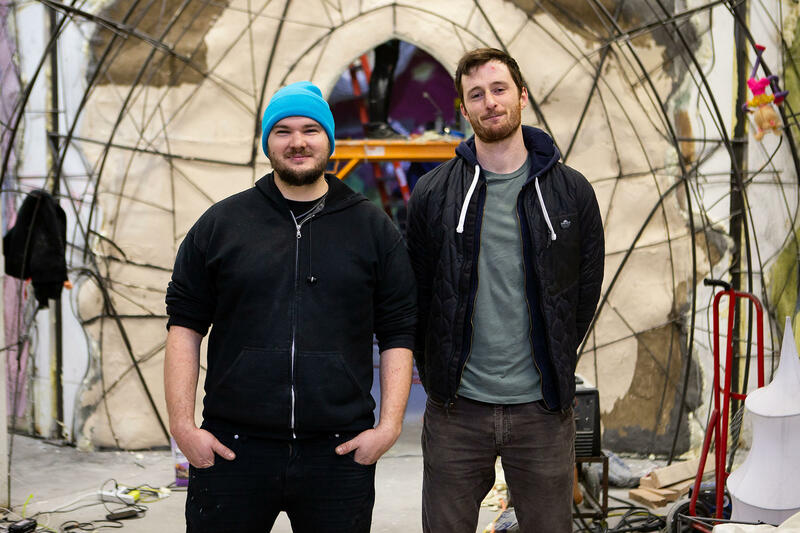 Fabrication director Leland Drexler-Russell (left) and creator Jordan Renda (right) first met in 2017. Soon after, Renda brought on Drexler-Russell to help him turn Otherworld into a reality. Drexler-Russell and Renda both cite Meow Wolf in Santa Fe and City Museum in St. Louis as their inspirations, along with sci-fi touchstones like Jurassic Park and Westworld. In the fall of 2017, Renda brought his pitch to banks and secured $2 million in funding. Soon after, Drexler-Russell moved to Columbus to work full-time on Otherworld. Scenes and objects from around Otherworld. 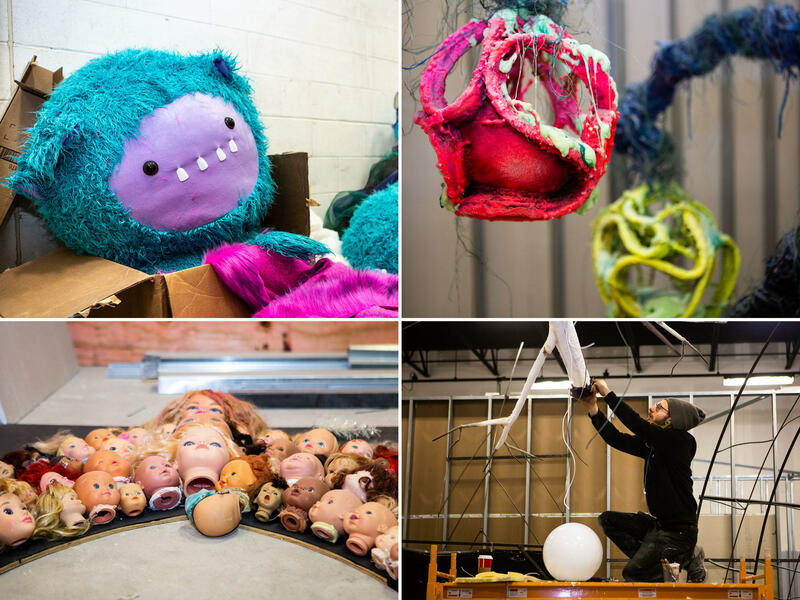 Clockwise from upper right: The head of a fuzzy bear creature; an alien plant sculpture; a tech worker installing lights in the Tree of Life; an arch of baby doll heads. Some 50 people are now rushing to meet their deadline, including two build teams, a textiles team, metal team, tech team, digital designers, and finish painters. 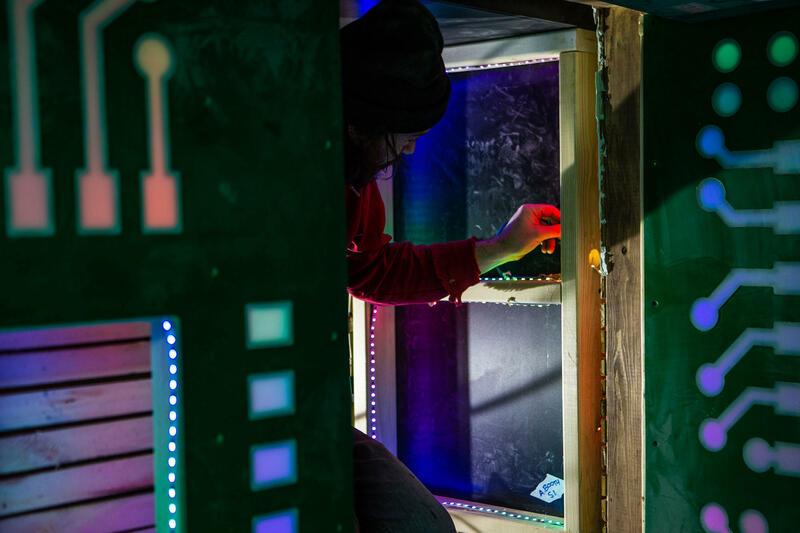 Ben Ahlteen installs lights inside of a crawl space hidden within an old video game console. Reynoldsburg may seem an auspicious location for something this, frankly, weird. But for the immensity of the production, this strip mall (and its unused parking lot) fit their needs perfectly. Otherworld has been under construction since June 2018, and is slated to open in late March 2019. 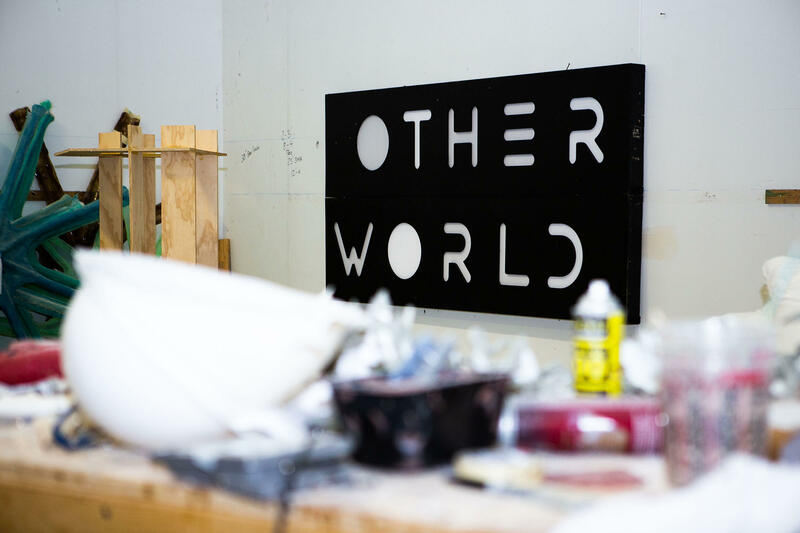 Renda hopes Otherworld will help make Central Ohio an international art destination in its own right. “Even Disney doesn’t have things that are that interactive on that large of a scale,” he says. 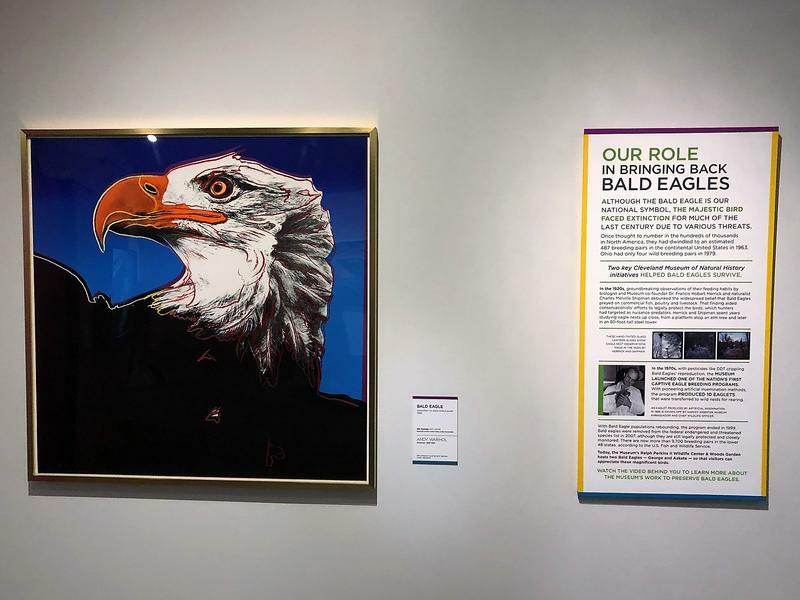 State of the Arts: What Does Pop Art Have to Do With Bald Eagle Conservation? The work of Pop Art icon Andy Warhol can be found at several museums across Northeast Ohio, but the last place you might expect to see his bright silkscreen prints is the Cleveland Museum of Natural History. On this week's State of the Arts, WKSU’s Mark Arehart takes a look at Warhol's "Endangered Species" series and how the museum helped to bring back one of the series’ subjects from the brink of extinction. Join All Sides Weekend guest host Clare Roth this morning for a conversation about art made in the Holocaust: who made it, what it tells us about that time and how it shapes our views today. Every Wednesday several women staying at the Norma Herr shelter in downtown Cleveland walk a couple of blocks to the ArtCraft building on Superior Avenue. It is home to a number of art studios, including Across the Lines, which launched earlier this year to provide women struggling with homelessness a place of their own to create. In a studio loft on the fifth floor, eight women sat around folding tables on a recent Wednesday afternoon. Each woman crafted her own piece of artwork. 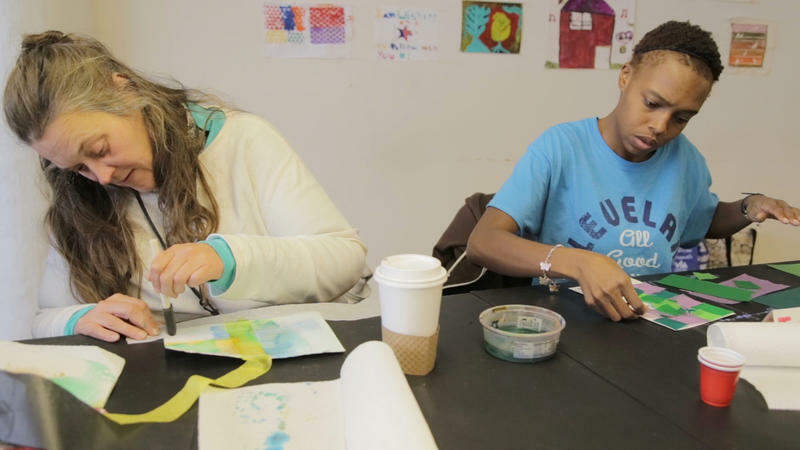 Doctors, Patients Sing Art Therapy’s Praises. So Why Isn’t There More Support? 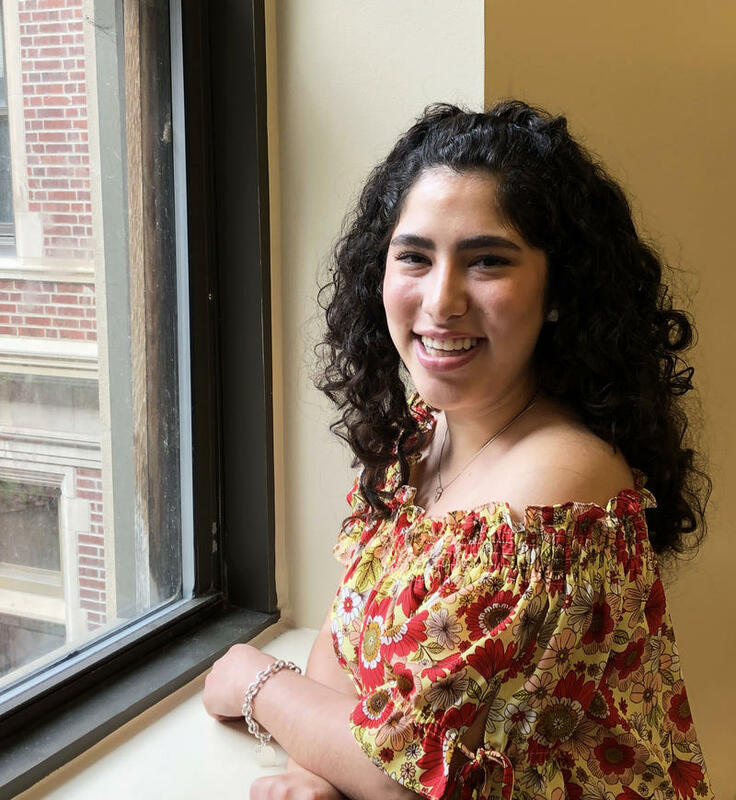 Paulina Nieto, who grew up in Columbus, Indiana, was only 2 months old when she started to have heart problems due to a narrow artery.